When “John the Collector” finds Lilly, barely alive, inside the walls of a shipping container that has been washed ashore on his island-between-worlds, he doesn’t realize how long her recovery will take. Or that discovering her and taking her home with him will make him a “Finder.” Or that she will attract attention from beyond his world. Or that she will have insight into the beginning. Or that she will be chosen and connected to every known human race. Young is a powerful writer. 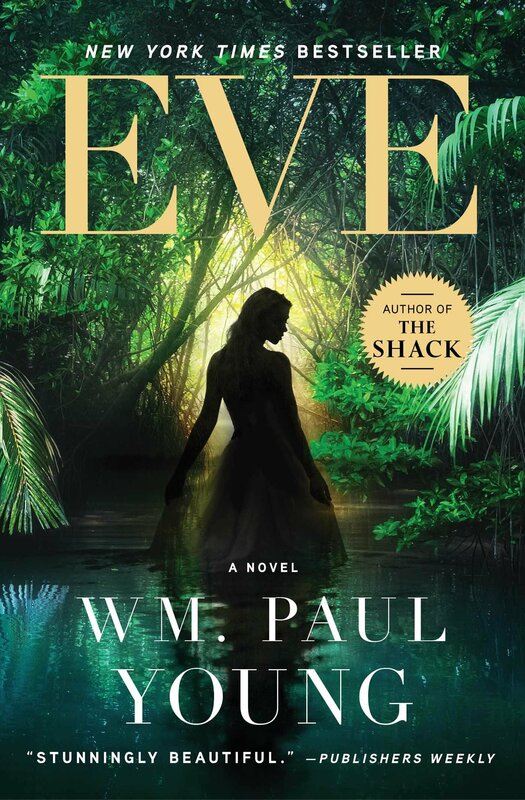 Eve includes bold images and strikingly new metaphors that demand attention and question one-dimensional understandings of original sin, the role of Eve, and the relationship between humans and God. For readers raised in the church, it is a refreshing look at a simple and beautiful part of Scripture that brings out the excitement, hope, and love present in the creation story. Eve reimagines the effect of temptation on both Adam and Eve, and fully fleshes out the idea of sin as being apart from God. His retelling of the story is a helpful counterpoint to theological perspectives eager to place blame on Eve, Adam, and the snake, in turn. The novel helps readers to reexamine their own assumptions. Young offers a perspective that makes both Adam’s and Eve’s struggles fully believable and easily recognizable in the reader’s own life. Instead of accusations, Young emphasizes the depths of sadness and love in the relationship between God and humanity. The novel can be confusing at times, and adds new characters and ideas at a dizzying rate. Some of Young’s metaphors may be a bit too obscure, but the entirety of the novel presents a glowing image of God’s desire for healing and rebirth. Whether a reader is just beginning to walk with God or has found their life-long faith growing dull, this novel illuminates the spaces between the text of Genesis in a way that helps readers examine their own relationships with God. It asks Christians to imagine bigger and dream bolder about the power of God to create new life, both physical and spiritual, and to always return to the love and presence of God. Disclaimer: This is a work of fiction and as such, the author does reimagine and interpret the biblical text from his own perspective.